Exposure to the sun can boost vitamin D production, release endorphins, and help treat skin diseases, but it can also cause serious damage. Australian design duo Claire Harris and Skye Hollingsworth have created a modern, stylish alternative to ordinary beach shelters that provides protection from the rays without making you feel like you’re missing out on the fun. Claire and Skye are longtime friends who love the beach but want to keep themselves and their families safe from overexposure to the sun. Their creation, called Sombrilla, is a sun canopy that resembles a billowy spinnaker sail with its vibrant, graphic designs. Sombrilla is made with cotton canvas that provides 95% UV protection, and the rust-proof framework is durable yet lightweight, so it’s easy to carry to the beach, park and backyard. 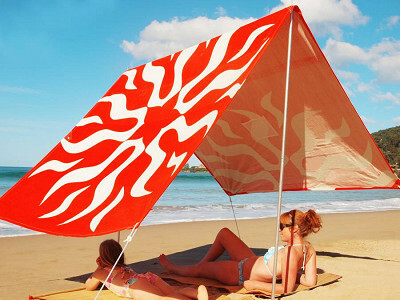 The canopy is adjustable so you can stay under cover as the angle of the sun shifts. Some sun tents can be stiflingly hot, but not Sombrilla. It provides a roomy shaded area for the whole family to lounge, play games and eat picnic lunches. The air flows freely, so you’re sheltered from the sun without feeling separated from the beach. You can have your fun in the sun, but without putting yourself in harm’s way. 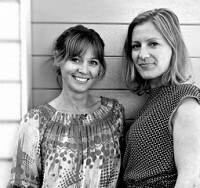 Hollie & Harrie, two Australian mums who love the beach so much we've designed a beautiful way to help you enjoy the sun safely - the Sombrilla beach shelter! With up to 95% UV protection you’ll find these stylish Sombrillas on beaches from Bondi to Port Douglas and now available to you in the USA. Let the sun shine on...and save your skin! We're online right now if you have any questions about our Sombrillas...ask away, we'd love to hear from you. Let the sun shine on...and save your skin! @Skye Is there a warranty for so many years for this product or can you tell me how long these should last? It's totally worth the cost if it lasts for years. So many products for the beach only last for a short period before the wind and sand destroy it. Thanks! @Kelly Hi Kelly, we guarantee our product for 10 years, although it should last a lot longer than that. Each part of the Sombrilla is stringently tested; the grommets are brass and so rust proof and behind each one is a synthetic lining so they can't be torn out by the wind and repetitive use. The aluminum poles are also rust proof and the canopy itself is a very thick cotton canvas which can withhold strong winds and strong children (who love using them as backyard cubbies). I see that you mentioned that the canvas can withstand strong winds. But how does it function when it is set up at the beach on those windy days? As we all know, most days at the beach are very windy! Do the stakes stay in the sand? Do the poles stay straight and not bend? Does the whole thing not lift away in a strong gust of wind? Yes, the Sombrillas can handle the wind within reason that is. A howling gale is a bit tricky but a good breeze is no trouble at all. It is important to make sure that the wind can pass through the canopy, not directly on to the side of the fabric - this will help relieve the tension placed on the ropes and pegs. The other trick when it is breezy is to ensure that the pegs are pushed all the way in to the sand, even slightly beneath the top layer so that they are not able to move at all. The wind does place a lot of pressure on the pegs and wants to pull them out but if they are pushed all the way in to the sand and have no way to move, then all should be fine. Please feel free to email me with any further questions. Just to complete your question Pamela, no, the poles are made of very strong aluminium and although they are nice and lightweight for carrying, they will certainly not bend! I am a lupus patient in the US, and I want one of these to use when I garden.. Sadly, they are WAY out of my price range. But kudos to the two of you for a fantastic, simple idea that has more uses than just the beach! Hi Anne, thank you for your lovely comments! Yes, you are so right - the Sombrilla is handy in all sorts of situations - picnic in the park, use it for the kids in the backyard - absolutely anywhere you are seeking some relief from the hot sun! Love this product. We take a family vacation - just 8 of us this year - and I have a couple of questions. Can three or four adults in beach chairs fit under it? A couple of seniors need to get out of the sun. Also - how long to set up/take down - at a guess? I would LOVE to get one of these but $186? I think you've priced a lot of families out of your market. An extra vacation expense of that magnitude would be hard to swallow, even though it will last for years. We bought this for a recent trip to Siesta Key, FL. The winds were shifting a bit on the beach (which made it a little tough to put up) but in a short time it was done and provided great shade. Once up it handled strong wind gusts without a blink. Umbrellas went flying but not our sombrilla! Thanks for a well made and well designed product! Am sure we will enjoy it for many years to come. Exposure to the sun can boost vitamin D production, release endorphins, and help treat skin diseases, but it can also cause serious damage. Australian design duo Claire Harris and Skye Hollingsworth have created a modern, stylish alternative to ordinary beach shelters that provides protection from the rays without making you feel like you’re missing out on the fun. Claire and Skye are longtime friends who love the beach but want to keep themselves and their families safe from overexposure to the sun. Their creation, called Sombrilla, is a sun canopy that resembles a billowy spinnaker sail with its vibrant, graphic designs. Sombrilla is made with cotton canvas that provides 95% UV protection, and the rust-proof framework is durable yet lightweight, so it’s easy to carry to the beach, park and backyard. 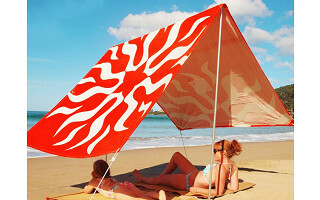 The canopy is adjustable so you can stay under cover as the angle of the sun shifts.